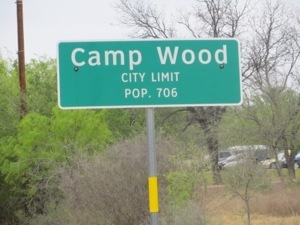 On the road by 8 am today, as it was suggested we make Camp Wood before 2 pm when the local cafe closes. 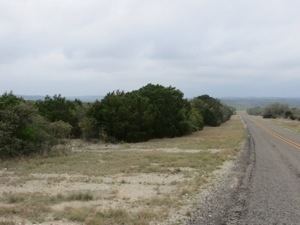 Still not enjoying the chip seal of Kinney County, though the surface of Ranch Road 334 did not seem as rough as US 90 did yesterday. We did have the benefit of overcast skies, so no glaring sun at all today; even some light rain after 4 pm this afternoon. 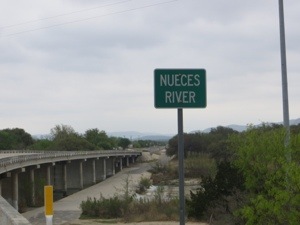 This photo at Las Moras Creek was taken as we left Fort Clark Springs. Donna and I were both too tired yesterday afternoon to take the picture as we entered the fort. Either way, our sins have been washed away. 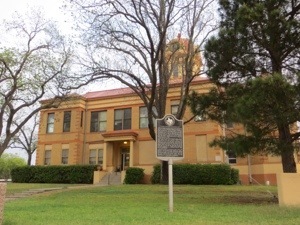 Since we didn’t actually see downtown Brackettville, I stopped to take this picture of the County Courthouse. 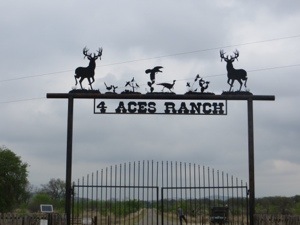 During our ride, we passed numerous farms, some with high fences; we think some are for wildlife conservation, others are hunting preserves, for deer, turkey, and pheasant. 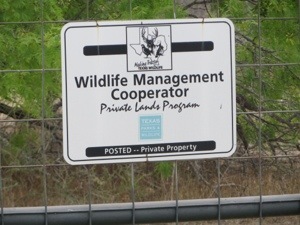 Also saw signs for Angus cows, Quarter horses, and goats. 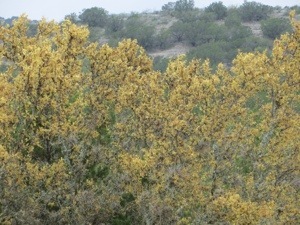 The landscape changed as well; fewer cacti and more trees, some in bloom. 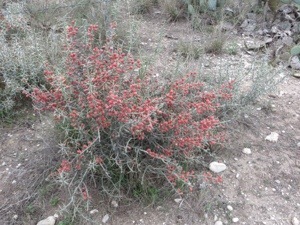 I did notice this cactus also starting to bloom. 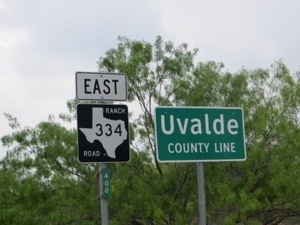 At mile 23, we entered Uvalde County, with no improvement in road surface (at least it didn’t get worse). 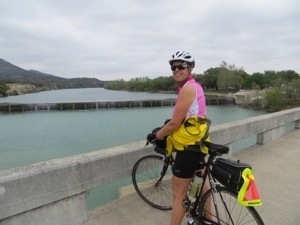 After dealing with a headwind all morning, at mile 30, we turned north and enjoyed the tailwind pushing us to the Nueces River and Camp Wood. 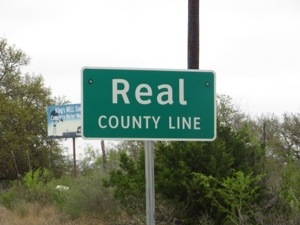 A mile or two before town, we entered Real County, again no improvement in road surface. 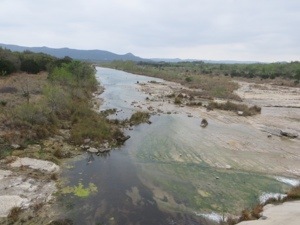 Made it to Casa Falcon for lunch about 1:30 pm, then wandered in town. Along the Main Street of Camp Wood, we stopped in Dolores’ Unique Designs, owned by Dolores Vernor. She has designed distinguished mohair fashions for First Lady Hillary Clinton, Former Governor Ann Richards, and numerous Miss Rodeo Texas. 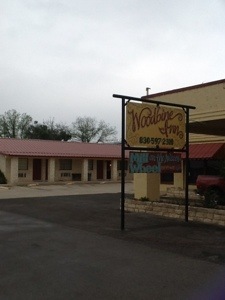 We are staying at the Woodbine Motel, comfortable, but definitely of another era. My roommate tonight is Flo Bathia. We may have begun the second round of roommates now. Total 49 miles tonight, average 10.2 mph. 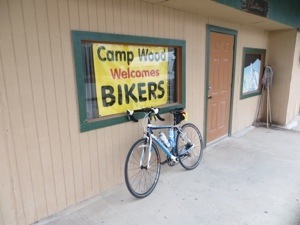 My sweet friend – I am not certain that the Camp Wood “Welcome Bikers” sign meant – well – peddles are second on the list. Motorcycles come to mind first – biker chicks – tats – lots of words that you (a Radford girl) never heard of. But the photo made me laugh!